Collecting interview material takes time and effort – and a little skill. So you want to get as big a return as possible. And that’s in a wide and varied collection of content that comes alive with ‘people stories’. And the more original content you can create, the better. In this article, which is the 4th in our series, we explain 4 types of content that you can create using interview material. Follow the models, adapt them for your own purposes and you’ll never be short of content ideas. This graphic explains the 4 main types of post or article that can be created from interview material. These definitions are a bit messy – the lines between them often overlap but they’re a great short cut to coming up with creative and compelling content that contain real people stories. So look to them for inspiration, rather than rigid formulas to follow – and above all, have some fun! Let’s look at examples of each. This is probably the most common type of content created from interviews. And it’s the most straightforward! Interview at least three credible and relevant people, pick out their top quotes and use them to structure your article. 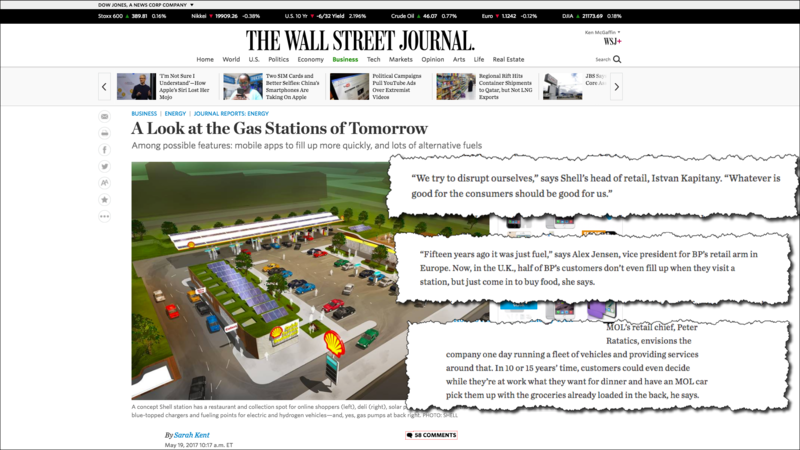 This article by journalist Sarah Kent, includes interviews from Shell’s head of retail, Istvan Kapitany, MOL Group’s retail chief, Peter Ratatics and Alex Jensen, vice president for BP’s retail arm. These interviews give fresh and varied content. They’re building blocks around which the article can be structured. Success in this type of article depends on being able to contact the right people, build a rapport with them and record what they say accurately. That might sound like quite a tall order if you’re just starting out – but as you progress, you will be surprised at how available your target experts might be. In-depth interviews are probably the second most common type of content created from interviews. They’re quite difficult because one or two answers is not enough. You need your subject to give you their undivided attention for between 30 to 60 minutes, and sometimes even more – we’ve all had interviews that have gone on for a couple of hours. These interviews are not something you want to rush – it takes time to get your subject to trust you and reveal their secrets. Building a rapport with your subject is crucial – fail to do that and you’re not going to have an exciting piece. The article features the story of Patrick O’Neil, founder of Olloclip. The article starts with the report of his Kickstarter campaign back in 2011, goes on to feature his family, his amateur photography hobby and his Steve Jobs influence. And the article ends with a great story of how his lenses are now used in healthcare – Olloclips were sent with doctors to Nepal to help them diagnose and treat eye conditions. Mr O’Neill says: “My pet project is to find other uses for Olloclips. Reading this article, you get a real sense of how the reporter built a rapport with O’Neil and covered a lot of varied and surprising material. Also worth noting that she didn’t choose a boring headline for her article, like “Interview: Patrick O’Neil, Founder of Olloclip”. 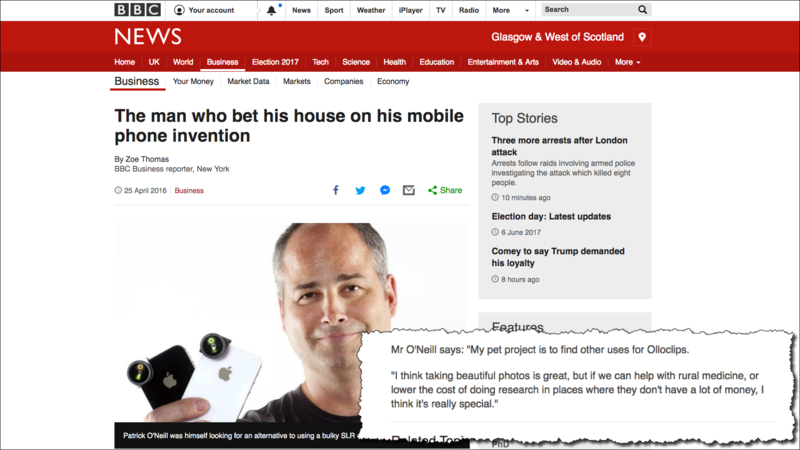 Instead, she took one of the stories from her interview and used that creatively in the title, “The man who bet his house on his mobile phone invention”. Writing posts based on a single quote or idea can be the most productive approach for generating fresh content ideas. All you need is one good quote to kick your post off – then you can take it in whichever way you want – agree or disagree with the quote as you wish and develop your answer. 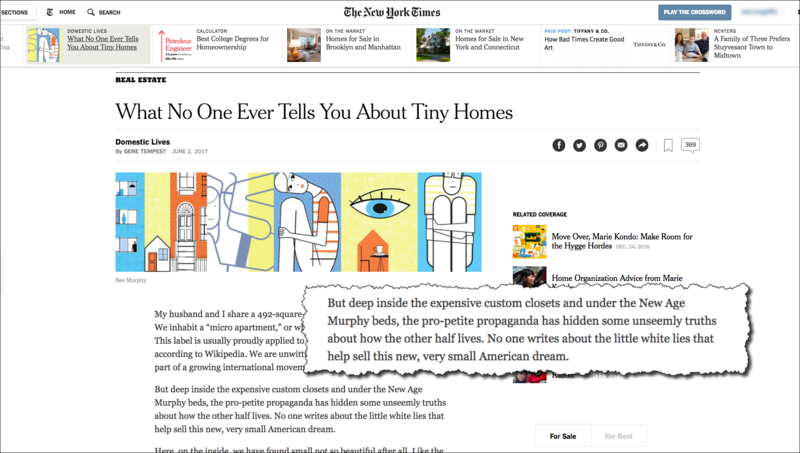 Take this example, What No One Ever Tells You ABout Tiny Houses, https://www.nytimes.com/2017/06/02/realestate/what-no-one-ever-tells-you-about-tiny-homes.html which covers the down side of the Tiny House movement in the US. You have an interview that doesn’t really catch fire – a common occurrence for anyone doing interviews. You don’t have enough material to write a complete post based on the quote. However, there could well be at least one useful sentence in there, but your subject doesn’t elaborate. You don’t want to waste the interview, so to enhance a ‘how to’ article or resource article – even though it won’t contain anything more from the interview. It’s also useful if you hit the jackpot and your interviewee share a ton of disparate but useful information. 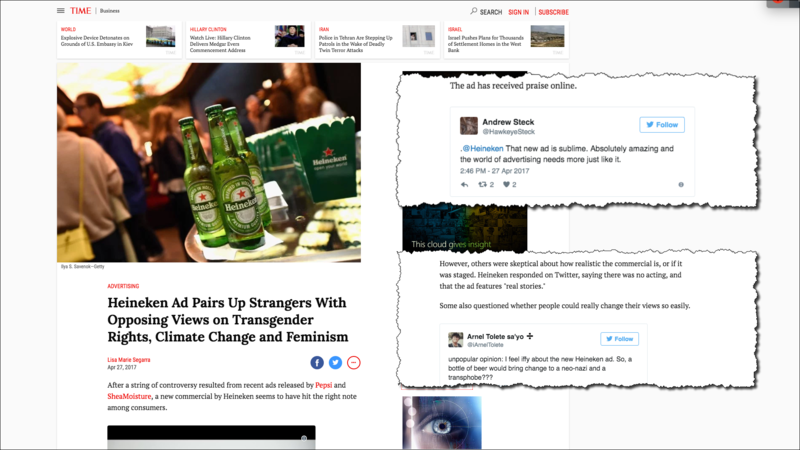 Rather than force it all into a single article, treat each useful quote as the introduction or conclusion to a series of posts. Debates or controversies are difficult. First, you have to give equal credence to both points of view. And second, and perhaps most difficult, you have to motivate your reader to absorb the piece. People often like to have their own opinions reinforced and just might not be in the mood to look at both sides. So approach with caution! The ad campaign attracted both praise and criticism but did bring a lot of attention to the brand. If you do decide to go down this road, be ready for the flack! So how do you organize interview material? Store all your material in a dedicated folder. And if you have a lot of material, using subfolders will also help. The secret here is to store the material as you collect it, it’s really hard to go back over stuff and remember exactly what it is about. Write a master list of all the interviews you have conducted. An online spreadsheet is an ideal way of doing this – and it means you can access it anywhere. Again you should do this as you work. Take our word for it, it will save you many wasted minutes and hours! Once you’ve collected most of your interviews, review your master list. Make sure you got everything that you need, and if there are gaps plan interviews to fill them. Brainstorm articles you could write based on your interview material (based on the four main types we’ve already given you). It’s always a good idea to involve a colleague and your client in helping you decide the final list of articles or posts that you will create. Now plan your writing. Give yourself a schedule and deadlines. That’s it! Follow these basic five steps and you’ll make the most of your time writing content. But of course, develop your own methodology over time. Good luck! Here’s the process I use for creating content based on interviews. You will have your own ways of working so please take this as a guide and adapt to your own needs. 1.Review again exactly who this article is for. What value will it give the reader? Why will a publisher be interested? What do you want readers to do as a result? Sign up to your newsletter? Share your article with your friends? Or even buy your product? The clearer you can be on what you want people to do, the more relevant and useful your article is likely to be. Gather the specific quotes you are going to use. choose quotes that illustrate the points you need to make – you may not have quotes for all the points you want to make, but that’s okay, try to force it. write your subheadings – this is a great way to help you organize your article. now you should have a good first draft – read the whole thing from start to finish and do a final edit. Now create an attractive image or illustrations to accompany your article – and the job is done! That’s it! If you’ve followed the steps, you should have a fantastic, relevant piece. How to use great stories to create remarkable content.